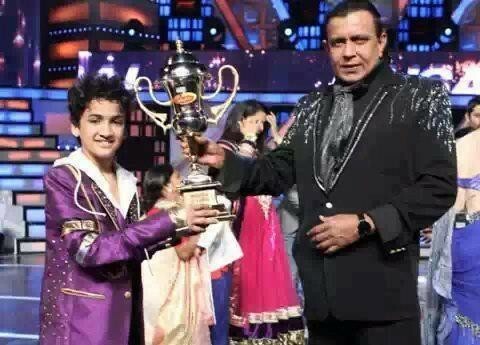 A 13-year-old Mumbai boy from a less-privileged background won the dance reality competition "Dance India Dance (DID) Lil Master Season 2" after getting a public vote from millions of fans across the country on Sunday night. Faisal Khan, whose father earns a living by driving a taxi, was honored with a trophy and a scholarship of Rs.100,000 for his exceptional performance that portrayed the golden era of films. Among the five finalists, who enthralled the audience with their electrifying performances for nearly 12 weeks, were 7-year-old Jeet Das from Kolkata and 11-year-old Saumya Rai. Both performers stood at fourth and fifth positions respectively and were each given Rs.100,000 as prize money. Rohan Parkale, 12, from Indore came third and Om Chetry, aged 7 from Assam, stood at second position. Both the finalists were awarded a cash prize of Rs. 300,000 and Rs. 500,000 respectively. The finale, which was held in Pune, had thousands of spectators and supporters rooting for the young dancing stars. "Only one wins but nobody losses here at this stage. Each one of you is a winner in my eyes," Grand master Mithun da (Chakraborty) said before announcing the final results. Bollywood star Akshay Kumar and choreographer-director Farah Khan graced the evening with their presence. Bowled over the youngsters' incredible talent, Kumar offered all 5 finalists a chance to be a part of a promotional dance video of his upcoming film "Oh My God". The winners were decided by public voting which surpassed all previous records of the dance reality show this year with a total 56.1 million votes. The second season of the show began in April this year, with top 20 dancers, who were aged 4 to 13 years, selected for the final competition in Mumbai. The selected contestants were mentored and trained by four skippers - Neerav Bavlecha, Kruti Mahesh, Raghav Juyal, Prince Gupta. They were also judged by choreographers Geeta Kapoor and Marzi Pestonji.